Town-home conveniently located by Powder Mountain and Snowbasin resort ski areas.Snowbasin home Powder mountain Snowbasin Real Estate, Ogden valley Rentals, Powder Mountain Lodging, Ski Resorts Lodging, Huntsville lodging, Eden lodging, Liberty, Ogden Valley, Eden real estate, Huntsville real estate, rent vacation homes, Wolf creek Utah rentals. Want to get it away from it all but have it all? SPRING SALE - Reduced 30% - SAVE for the Year! Property Size 2,750 sq. ft. This town-home has three levels so that guests can spread out with a living area on the main and lower levels. The main level is open with the kitchen, dining and living room sharing the space. Dramatic fireplace, mantle, vaulted ceilings and wall of windows bring in an abundance of natural light. The lower level has radiant heat, which is a necessity in colder months and a custom theater room for family movie night. Also found on the lower level has another living room with a flat screen TV, a bedroom with two queens with a full bath and a card table for those who like to play. The upper level has an expansive master suite and two other rooms for sleeping that share a bath. The back patio and main level deck provide spectacular views of alpen sunsets. The Cascades development has a lot to offer with 48 spacious town-homes in 8 Buildings. The Buildings have an old world style with tall straw finished fireplaces, concrete mantles and travertine flooring but also modern touches of large rows of windows, dramatic great room vaulted ceilings and 8-foot solid alder doors and cabinets throughout. The onsite amenities include a clubhouse with workout room, two (2) hot tubs, one (1) swimming pool, sauna, community grills, sand volleyball court with outside gathering space. The Cascades has three (3) floor-plans ranging from 2800-3600 SF sporting 3-5 bedrooms with two (2) car garage. Buildings have radiant heat in the below grade levels and heat tap of the roofs for snowmelt. Fully landscaped grounds with a multitude of steams and waterfalls. 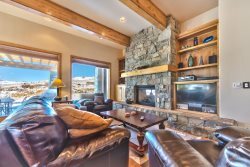 The neighborhood is located at the entry of Wolf Creek Resort and has daily UTA transfers to Powder Mountain in Winter months. Powder Mountain does live up to its name. It’s one of the most remote ski areas on the Wasatch Range. It can be a journey to get there but a skiing Mecca once arrived. It truly has it’s own Vibe. Owned by a group of entrepreneurs from Silicon Valley with investors that span the Globe, it’s fresh, iconic and old school. Summit Series is working on an expansive masterplan at the top of the mountain beyond Hidden Lake. Some areas of the masterplan will be open to the public and some areas private for their investors. Today it’s as it was 50-years ago with the addition of a high-speed lift chair at Hidden Lake and another high speed lift chair under construction this year. Powder Mountain has a variety of skiing opportunity from cat skiing to night skiing with the convenience of on-mountain ski and snowboarding rentals. Restaurants at the Base Lodge include the popular Powder Keg that offers live music most nights, draft beer and bar food such as chicken wings, burgers and kale salads. Upstairs at the Base Lodge is a cafeteria that is perfect for families serving Lucky Slice pizza, breakfast burritos, burgers and other comfort food. At the top at Hidden Lake the menu is more Mexican Cantina style with street tacos and taco salads. The Utah Lodging team, especially Art, was great throughout the process. He worked with us through email and responded rapidly to any request. It could not have been easier in finding and renting a property. We had a wonderful weekend of skiing, snowshoeing and family fun. The unit had enough space for all of us to spread out when we wanted but had a great large dining table for family meals and a theater room for our movie nights. We had a blast! Excellent completely friendly and went above and beyond to help us. All reservations are billed a one-time processing fee of $50. Departure clean is $275. 50% of the total is due at time of booking. The full amount will be due 14 days prior to arrival. Cancellation Policy: Any reservation canceled 30 days or more prior to arrival will have their deposits refunded minus the $30 processing fee. Reservations canceled within 30 days of arrival will forfeit their deposit. Reservations canceled within 14 days of arrival will forfeit the entire amount of the reservation.